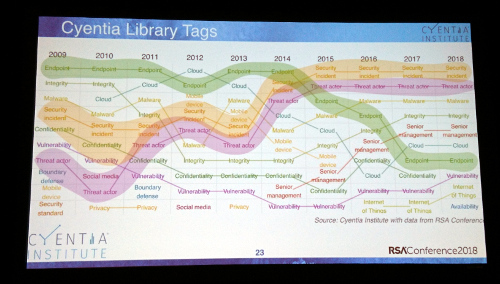 I don’t know where you are, but the data analysis of the RSA Conference by the prestigious Cyentia Institute is amazing. 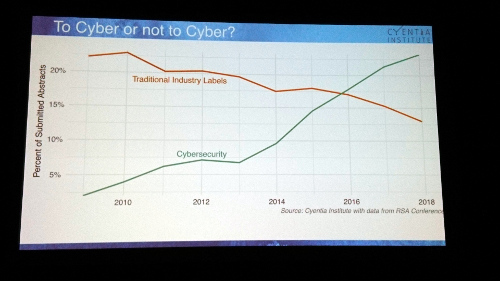 They wrote algorithms to tell us what the “most important” talks are each year from 25 years of security conference data, and illustrate our industry’s trend over time. Who can forget “A top 10 topic in 2009 was PDAs”? Trends going up? GDPR, Ransomware, Financial Gain and Extortion. Big Data exploded up and then trends down over the last five years. Endpoint going down is fascinating, given how a current ex-McAfee Marketing Executive war is going full-bore. RSAC 2018 Expo Protip: people working inside Clownstrike and Cylance are unhappy with all the noise they make about attribution and threat actors given their actual product performance and value. That’s just a pro doing qualitative sampling, though, so consider the implication of qualitative analysis.